The Sulod are the most populous of the varied cultural-linguistic groups inhabiting the mountains of Central Panay; Tapaz, Capiz; Lambuano, Iloilo; and Valderrama, Antique Provinces, who remain relatively unassimilated. They occupy the rugged finger-like slopes along the banks of the river in the interior and higher mountains. Due to the sandwich-like location of their territory, the inhabitants earned the moniker Sulod by their neighbors, which literally means “closet or room”; they're also called montesses by lowlanders, which means “mountain dwellers”. They speak a dialect that is a combination of Kiniray-a which is characterized by many archaic expressions and Lliligaynon; most of the Sulod are monolingual. As shifting cultivators, the Sulod rarely stay in one place for more than two years, growing upland rice, maize, sweet potatoes, and other edible tubers. They incorporate hunting-gathering to supplement their subsistence, catching fish with hook-and-line and fish traps; they also gather vegetable products such as edible fungi. 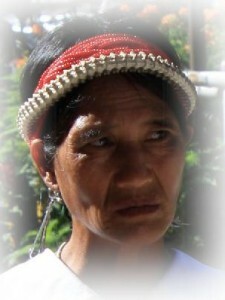 Their attire is ordinary reminiscent of the lowland Bisayans. On momentous occasions, the women don headdresses decorated with narrow strips of cloth lined by silver coins and glass-beaded necklaces intertwined with silver coins. Young men, on the other hand, sport trousers and shirts, and the elders opt for g-strings; their headwear consists of an ordinary buri hat, made from the buri palm (the most stately and largest of the Philippine palms). Leadership is accorded by the eldest man in each settlement, known as parangkuton or “counselor” (literally translated as “one to be asked”), presides over activities such as hunting, house building, and moving to a new kaingin site. Additionally, he resolves disputes and supervises annual social and religious enterprises. When the paragnkuton dies, the next eldest man in the settlement assumes the leadership. Unique to their cultural practices, is the keeping of binokot, which is concealing their beautiful women in closed rooms, away from the eyes of any man; binokot was later incorporated to mean “record keepers” of their people. This, in turn, became the principal sources of many Visayan epics such as Hinilawod, Humadapnon, and the story of Labaw Donggon. Religion is an intimate element of Sulod life; every activity is in accordance to the wishes of the spirits and deities, and, the individual does everything within his capacity to appease these divinities, even to the extent of going into debt, in order to 'celebrate' a proper ceremony for the principal spirit, diwata. There are 16 annual ceremonies and a number of minor observances, most of which are conducted by the baylan; men or women appointed and whose sole functions are to communicate with the preeminent spirits during seances and interpret dreams and omens relative to the well-being of the communities.